Love to decorate and brighten your Bible? Smile, God loves you! That's the cheerful message on each of these foil-edged smiley face stickers encircled in eight assorted colours. Boys and girls will love both the illustration and the sentiment. Useful on cards, papers, books, crafts, and more. Each sticker is approx. 1" x 1". Six sheets, 16 stickers per sheet; 96 stickers per package. 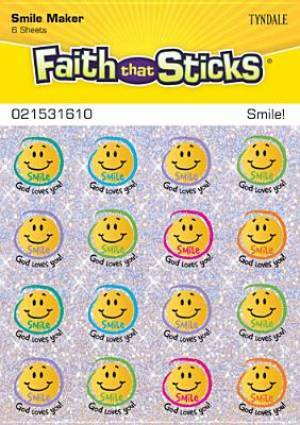 Smile Stickers by Faith That Sticks was published by Tyndale House in December 2013 and is our 226th best seller. The ISBN for Smile Stickers is 9781414392851. Be the first to review Smile Stickers! Got a question? No problem! Just click here to ask us about Smile Stickers.